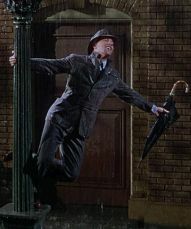 Gene Kelly. Debbie Reynolds. Donald O'connor. Cyd Charisse. Arthur Freed. Classics. Musical. Film in Film. Peoples' Choice. Dance. Dave T's Platinum Picks. AFI Top 100 Movies Ever. Critics' Top 100. Guardian 1000 Must See (2007). 01 Tara's Midnight Movies. Recommended. 01 Ade tastics. Just simply the best musical ever made. Witty, inventive, brilliant, wonderful and slightly surreal; it manages to parody Hollywood without ever quite descending into self-parody, always retaining its dignity (always dignity...) A must-watch every few years or so.